(1) It had to be a LOW-COST makeover. (2) I wanted to bring in elements of nature. (3) I wanted it to be kid-friendly. I fell in love with the idea of using tree decals on our large, empty wall to give it some dimension, but they were so expensive. So I started to think, could I make them on my own? It was not like I desired a very intricate design. 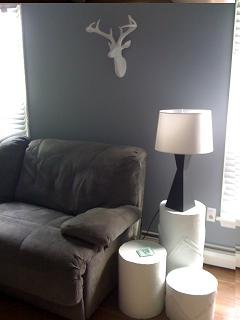 So I slapped a coat of gray paint on the wall and bought a few rolls of Con-Tact paper. 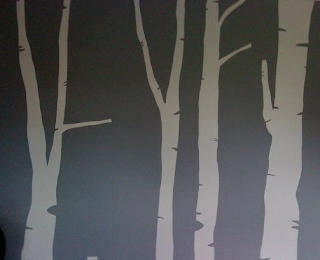 I drew some free-form tree shapes on the back on the paper, cut them out, taped them to the wall with painter’s tape, pulled off the back, and voila! They look painted on, but they peel off easily if I get sick of them. I finished off the room with an eclectic, upcycled wall of art. The frames were all dollar finds at local antique stores and garage sales, spray painted white (in the wind on a tarp in my driveway. The proof of the project still exists on the black top. Whoops.) The Audubon-style bird print was a cheapy from an antique store – almost identical to the one found at PB last spring (for much, much more). 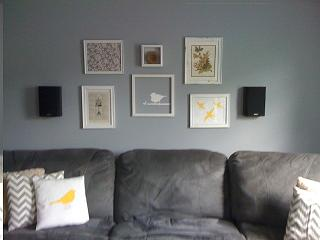 The gray and yellow bird print and the stamped dictionary page were etsy finds. The white bird in the center was another Con-Tact paper freehand design. I added a bird’s nest from Amazon to a small shadow box above the white bird. Finally, the last frame was filled with a piece of gray and white fabric. So, this was my summer project, what was yours? Previous Post: « Might They Have Modeled Sid the Science Kid After My Son? Very cool! Love the trees! Great job on the decals! Thanks for stopping by an saying hi, I am your newest follower. That is awesome! Does contact paper come in other colors? How tall are your trees? Could I make trees that are 6 feet tall?